The E-460 is an integrated amplifier, capable of delivering a power of 2 x 180 W into an 8 Ω load, or 220 W into a 6 Ω load, or up to 260 W into a 4 Ω load, was one of the major successes of the Accuphase company. Based largely on the achievements of its predecessors, this model introduces a myriad of innovative solutions that completely changed its status within the manufacturer’s offer. It utilizes an innovative volume control system and a triple parallel push-pull circuit within the output power circuit, based on MOSFET transistors. A balanced construction of all sections of the amplifier – including the power amplifier stages – allows for a significant reduction in noise and distortion, while maintaining a clean signal. The amplifier uses current feedback and an improved MCS+ topology. The predecessor of the E-460 was exceptional. The award-winning E-400, produced over a long period of time, has collected excellent reviews among users as well as professionals in Japan and abroad. 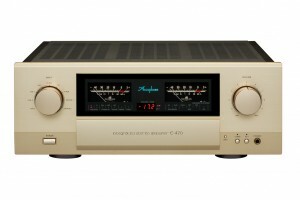 It is this 400 series has has gained the status of a key offer of Accuphase. The E-460, which has replaced the popular E-450, is the next step in the development of the series. The most important innovation in this case is the even more refined version of the revolutionary AAVA gain control circuit. 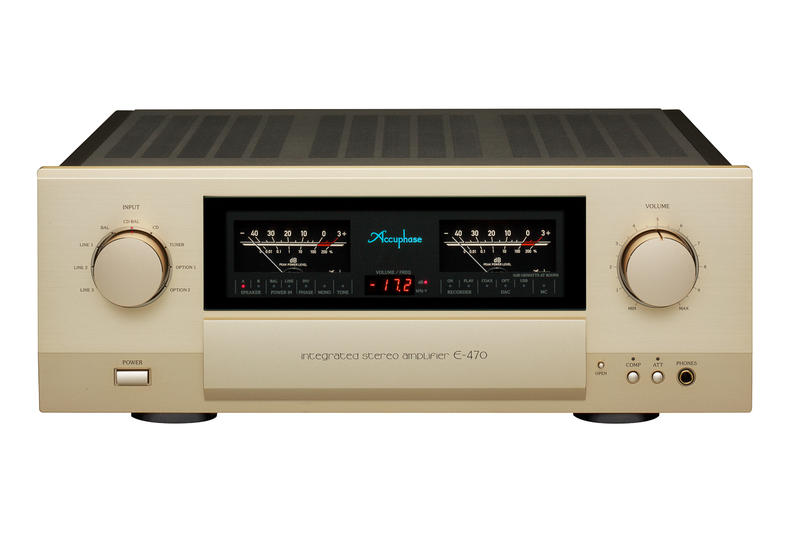 E-470 is the successor to the E-460 and takes over the flagship model within a group of amplifiers, the power amplifier of which operate in Class AB. Within its technical merits, special attention needs to be drawn with respect to the ultra-low distortion figures and a very high damping factor. Solutions by which such performance was possible to be achieved, were taken directly from the models that were prepared for the 40th anniversary of the company: the C-3800 preamp and A-200 monoblock. The E-470 opted for an evolutionary improvement in performance, rather than a design revolution. 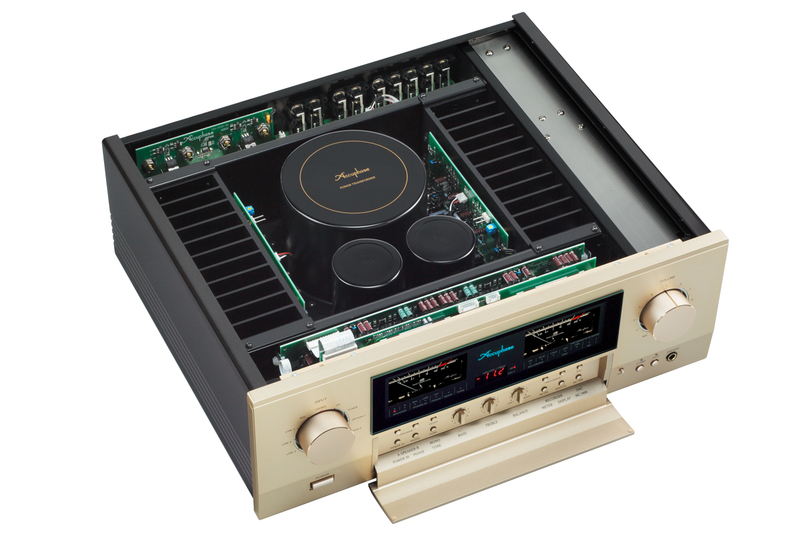 Accuphase engineers, remaining within the spirit of Japanese philosophy, came out with the assumption that it is better to improve existing, proven solutions, rather than to change them for a better one, but starting from scratch. Although the output power is still at 180 watts into an 8 Ω load, the E-470 has a significantly improved headroom. It is able to give back a music signal (or peak) of 200 W into 8 Ω and 290 into 4 Ω. So we can speak of an integrated amplifier with very high “real” output power. An almost unbelievable change was a further reduction of the noise level. Although in the previous models it was very low from the outset, the output of the E-470 can now be measured with its own noise at 34 microvolts, which means a reduction of up to 68% (-4 dB) relative to its predecessor! Remember that the noise reduction is, rather, a means to an end, and not the ultimate goal as such. It simply translates into a much better sound. Such outstanding performance is achieved by a parallel connection of two (instead of one) VI converters within the AAVA volume control system. Such a design change hase made it possible to reduce the noise of this section down by 2.5 dB. Another important change that was introduced is the use of a more sophisticated feedback circuit within the power amplifier. The E-470 feedback system implements an ultra-low impedance. This solution, as compared to the E-460, reduces the noise by a further 1.5 dB The attenuation coefficient for the inputs has hence also improved, currently at a level of 500. Please note that this is 2.5 times more than in the case of the E-460, and also exactly the same figure as in the company’s best integrated amplifier, the A-class model E-600. The nameplate value of the attenuation coefficient, stated as “500” is guaranteed for each and every produced item, but in practice it is even more, because it reaches about 700. The damping factor is a value that determines the amplifiers capabilities in executing control over the speakers which are connected to it. It is calculated as a ratio of the nominal impedance (eg. 8 Ω) as referenced to the output impedance of the amplifier itself. The higher the score, the better the amplifiers control over the speakers, especially in the area of the characteristics, where the impedance dips. Independently and in addition to the changes introduced within the feedback system, a reduction of the output impedance was possible and was further facilitated by a technique called “Remote Sensing”, whereby the feedback signal is taken off the output from as close to the speaker terminals as possible. The E-470 uses a balanced system of this type, which has significantly improved its performance. This technique also improved the harmonic and intermodulation distortion of the amplifier. The most commonly used solution within amplifiers, a means for providing security to the speakers, are typically mechanical relays. The E-470 uses a much better solution, namely Semiconductor MOSFET switches. It was decided to embark on such a change because it provides for a “contact switch” which is much more reliable, is a long life solution and maintans its undeteriorated parameters for a much longer period of time, and the series resistance of the pass-through path (the “contacts”) is much lower. For maintaining the reduced resistance, suitable matched components are also introduced – including large, solid speaker terminals and low resistance coil outputs. PCB tracks are executed from much thicker material, providing for thicker current paths. The E-470 may be equipped with the DAC “DAC-40″ board, and on then, on it’s display, you can read the sampling frequency of the input signal. There are also power amplifier inputs and outputs to/from the preamplifier made available in both forms – both as unbalanced RCA and balanced XLR. The E-470 is the best and most advanced construction, within the class of integrated amplifier products which work in class AB, which till date has ever been produced by Accuphase.